女性乳腺在妊娠期间会经历乳腺小叶增生以至于以对分娩后的哺乳。图中可见充满粉红色分泌物的乳腺小叶。乳腺组织学上类似于汗腺，以出芽方式分泌。 The female breast during pregnancy undergoes lobular hypertrophy so that following birth lactation can occur. Seen here are lobules filled with pink secretions. 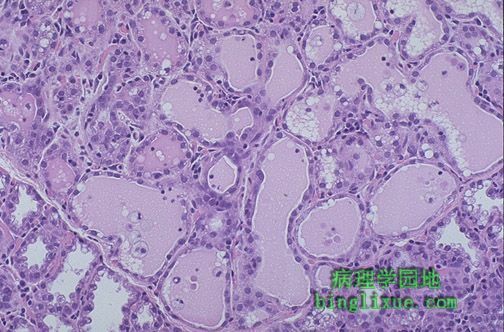 The breast, which histologically is a modified sweat gland, secretes by budding off of portions of cell cytoplasm.